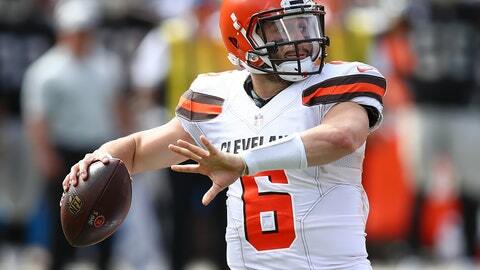 CLEVELAND (AP) — Baker Mayfield’s first NFL start came inside Oakland’s notorious Black Hole. The top overall pick in this year’s draft, Mayfield faces a major challenge in his first career home start on Sunday as the Browns host the Ravens. Baltimore’s ravenous, second-ranked defense has not given up a touchdown in the second half this season and made Steelers star QB Ben Roethlisberger look lost last week. Now they get a rookie to feast upon. Mayfield knows what awaits him. For the most part, Mayfield handled everything the Raiders threw his way a week ago in his first career start, a 45-42 loss in overtime. Showing some of the same poise and playmaking ability that made him a college star, Mayfield passed for 295 yards and two touchdowns. However, he committed four turnovers and the Browns (1-2-1) blew a 14-point lead in the second half and dropped to 2-33-1 in coach Hue Jackson’s tenure. Still, Mayfield, who came off the bench on Sept. 20 against the Jets and led the Browns to their first win since 2016, handled the adversity like a seasoned pro and converted a few more doubters into believers. The Browns may have finally found their leader. Mayfield’s about to face a defense like he’s never seen. Browns offensive coordinator Todd Haley knows the Ravens well. After spending six seasons with Pittsburgh going up against Baltimore’s tenacious defense twice a season, Haley smiled when told about Martindale’s praise of his young QB. Looking to get an advantage on Mayfield, the Ravens watched tapes of his games at Oklahoma and grilled tight end Mark Andrews and tackle Orlando Brown Jr., who were teammates with the Heisman Trophy winner. Asked if he watched HBO’s “Hard Knocks” to learn more about the Browns, Harbaugh shook his head. Mayfield was prominently featured on the documentary series this summer. The Browns aren’t giving rookie Nick Chubb nearly enough touches. They know it. “He has to get some,” Jackson said after Chubb rushed for 105 yards on just three carries, and scored on two long runs last week. The Browns intend to increase his workload this week, mixing Chubb in with Carlos Hyde, who has scored five touchdowns but isn’t a breakaway threat. Chubb has made the most of his 10 carries, rushing for 146 yards. According to Elias, Chubb is the first back in league history to rush for 100 yards and score two TDs on three runs. If Ravens quarterback Joe Flacco’s first four games are any indication, he’s going to have a fabulous season. He’s thrown for 1,252 yards, eight touchdowns and just two interceptions and has quickly developed chemistry with new receivers Willie Snead, Michael Crabtree and Jon Brown. Still, with 12 games left, Flacco and Harbaugh are not looking too far ahead. For Browns rookie left tackle Desmond Harrison, Sunday’s matchup with Pro Bowler Terrell Suggs will be a measuring stick. Hopefully, Suggs doesn’t use it on him. Harrison has sought advice from retired Browns star Joe Thomas, who had epic battles with Suggs over the years. The undrafted free agent insists he’s not nervous about trying to block one of the league’s best defenders. “I’m just going to play my game, how I play every weekend, not going to try to do anything different, just stick to the script,” he said.